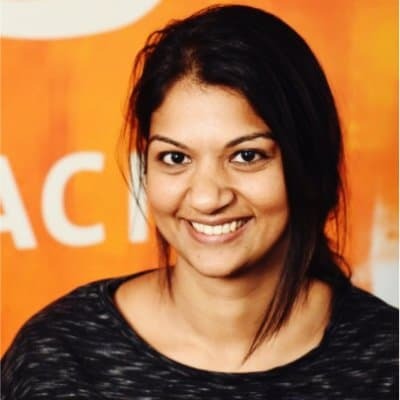 Before the Crowd release in July, API Manager was packed with capabilities to design, document, and test APIs using API portals, as well as manage APIs by adding governance to an API proxy or implementation in one place. Now, API Manager is even more organized and straightforward in its functionality to manage APIs. 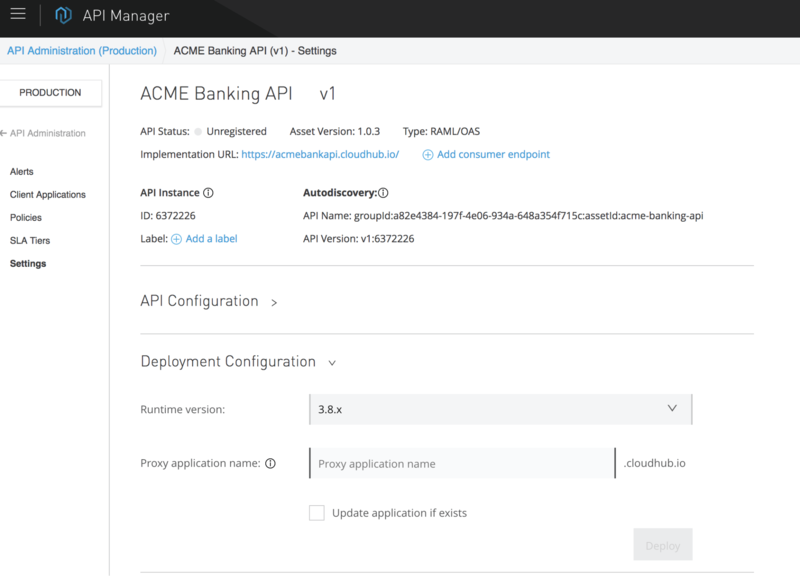 Let’s take a look at the new features in API Manager. With environment support in API Manager, you can easily promote APIs throughout the SDLC using a web GUI! The same environments you create in Access Management for Runtime Manager now shows up in API Manager. Once you pick an environment to manage your API in, you can click on Manage API and choose to manage an API that has been published to Anypoint Exchange or import one from your local computer. Managing multiple instances of APIs to provide regional support, varied governance, and more! with the latest release of API Manager, it is easy to create a new instance for the same API name and manage multiple instances with varied governance. To manage a new instance of the API, click Manage API > Manage API from Exchange. Fill in the API configurations information and click Save. Add the deployment configurations on the next page and deploy the API proxy (if you choose the managing type as Endpoint with Proxy). Best Practice: In order to distinguish between each API instance, you can specify an API instance label. This is a user-friendly name instead of using the instance ID as the name. Promoting a managed API instance involves maturing the API through different stages of the SDLC. Also, different people in the organization might have distinct roles and access to the environments where APIs have to be tested and validated. Finally, APIs should be promoted to the production environment for consumption by client applications. 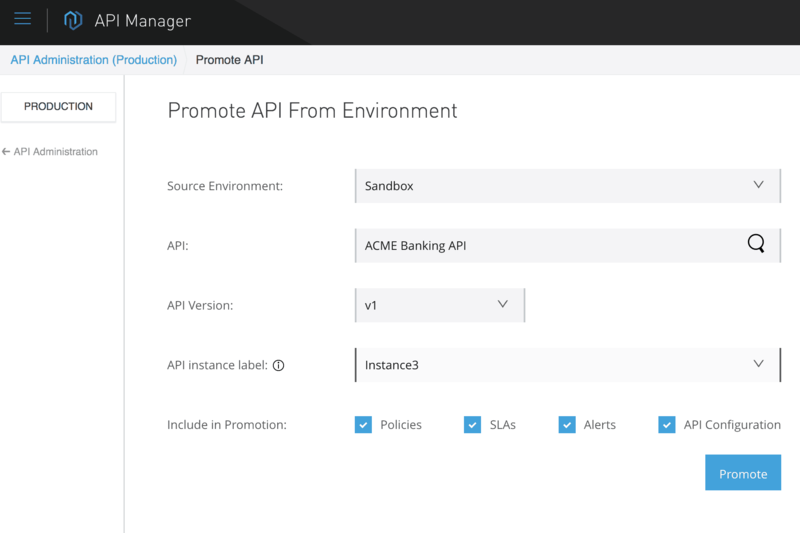 To promote an API from a Dev environment to Sandbox or from Sandbox to Production, switch to the target environment inside API Manager. You can do this by clicking the name of the current environment you are working in and selecting the target environment and clicking Switch. In the target environment, click Promote from the environment. Enter the source environment and information about the API to promote it from the source environment. Note: Unchecking the API Configuration checkbox allows you to rewrite the managing type, API Implementation URI, and deployment target preferences. Once you click Promote, you will be asked to enter the deployment configuration information and specify the API instance label. Each managed API instance is associated with the Exchange asset version of the API. If a RAML API specification needs to be revisioned (e.g. modifying the structure of datatypes, adding/modifying governance and policy information etc.) 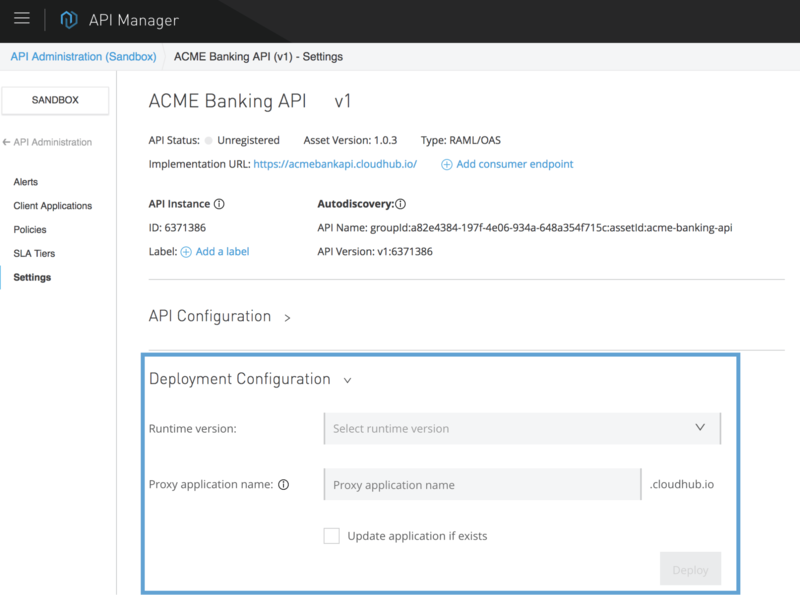 and a new Exchange asset version is created, API Manager now provides users with the ability to change the specification version of a managed API instance, to the latest published asset version. This helps in rapid iteration cycles throughout the APIs’ lifecycle. To change the asset version, go to the Settings page of the managed API, click Actions in the right-hand corner, then click Change API Specification. In the Change API Specification, select the asset version that you want to change the instance to and click Change. Note: Re-deploy the proxy, if the managing type is selected as Endpoint with Proxy for the change to propagate through. The managed API instances in API Manager are grouped by the API’s major version. So you can have multiple instances of the same API version that point to the same or different (pointing Exchange asset versions. 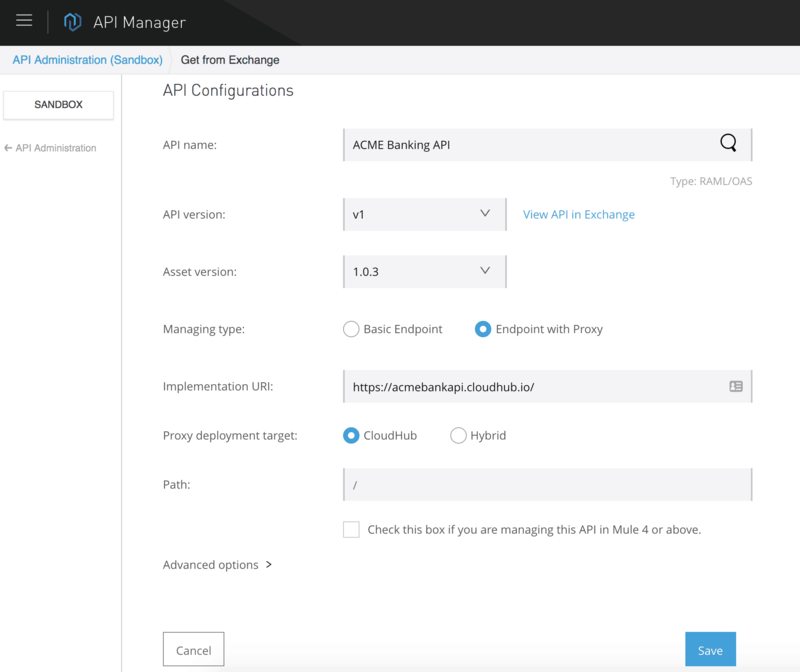 API Manager’s new API instance Settings page includes links to go to the Exchange asset or manage the API instance in Anypoint Runtime Manager. These links are convenient because you don’t have to click to the main menu to get to different sections in Anypoint Platform. 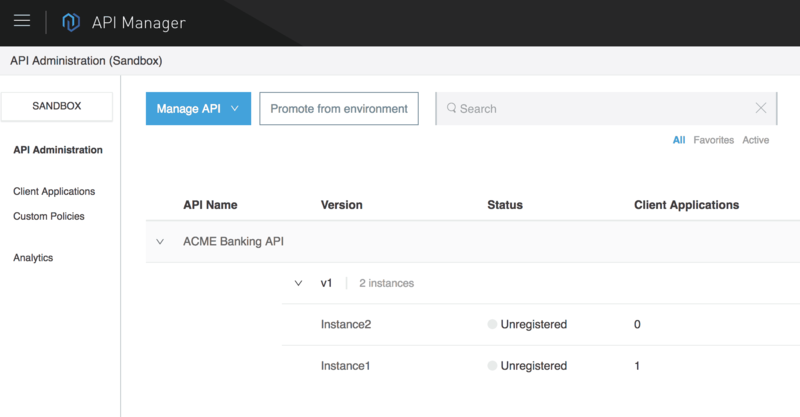 With these updates to API Manager, managing and maintaining APIs in Anypoint Platform has become even more intuitive. Now, the entire production-consumption cycle is handled within Anypoint Platform itself: API assets are designed (by consuming reusable fragments from Anypoint Exchange) in Design Center, published from Design Center to Exchange, and then managed inside API Manager. Hi, I am working on the API Manager & have pushed RAML with different versions to Exchange with different Assert Versions. In API Manager, I want to change the API Specification, but it doesnt not show the Assert Versions from Exchange. It only shows one Assert version.